L-R: Jayne Arkell of Equitone UK & Ireland, category sponsor; Melvyn King; Victoria Torres; Grant Giblett; Rob Woolston and James Badley (all rg+p) with Emily Booth, acting editor, Architect’s Journal. Compiled annually since 1995 by the Architect’s Journal, the AJ100 is a definitive list of the UK’s most successful and innovative firms. Practices which had secured a place within the top 100 were invited to a presentation evening at the Tower of London to discover their final rankings as well as the award winners. 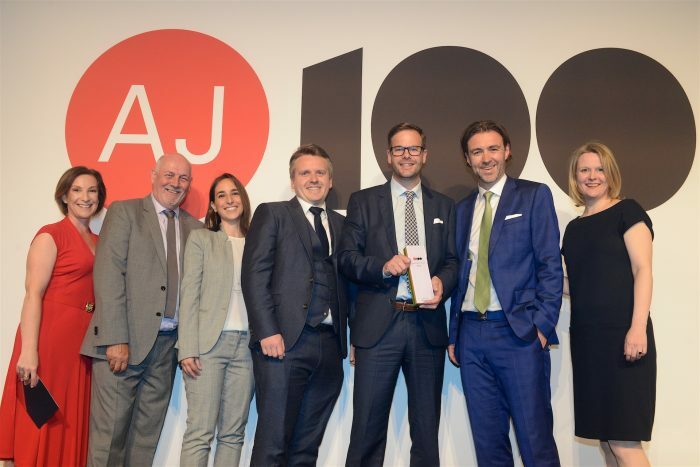 rg+p, which has offices in Leicester and London, was announced 89th in the list and crowned the 2018 New Member of the Year, a category to reward a practice which entered the AJ100 for the first time and is judged on quality of work and business success. Based on individual surveys submitted by the country’s largest architectural firms, the AJ100 is designed to provide a snapshot of the profession, measure levels of optimism across the industry and highlight the most dynamic and ambitious firms. rg+p’s placement follows significant growth for the practice, which saw a new Leicester head office open in November last year including space for up to 100 people. Currently, the firm employs 96 members of staff across its Leicester and London offices. Director James Badley added: “It’s certainly been a busy and thriving time for our business, as we’ve made substantial positive changes to our working environment, as well as a number of senior level appointments. To consolidate this with double success in the AJ100, the benchmark of excellence for our industry, is outstanding.